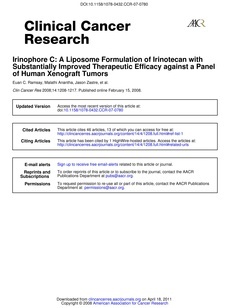 Purpose: To assess the pharmacokinetics, tumor drug accumulation, and therapeutic activity of Irinophore C, a novel liposomal formulation of irinotecan (CPT-11). Experimental Design: The plasma lactone/carboxy levels of CPT-11 and SN-38 were determined in mice after a single i.v. dose of irinotecan (Camptosar), or Irinophore C, and the plasma t1/2, plasma area under the curve, plasma Cmax, and plasma clearance were calculated. Further, plasma and tumor drug levels were also measured in tumor-bearing mice following Irinophore C treatment. The efficacy of Irinophore C was compared with that of Camptosar in five s.c. human tumor xenografts using single-dose treatment (LS 180), a total of three doses administered at 4-day intervals (H460), or a total of three doses administered at 7-day intervals (Capan-1, PC-3, and HT-29). Results: Compared with Camptosar, Irinophore C mediated an 8-fold increase in t1/2, a 100-fold increase in Cmax, a 1,000-fold increase in area under the curve, and a 1,000-fold decrease in clearance for the active lactone form of CPT-11. Further, the plasma and tumor SN-38 lactone levels were consistent for at least 48 h post-Irinophore C injection. Camptosar treatment (40 mg/kg) mediated a delay in the time required for tumors to increase to four times their pretreatment size compared with controls (T-C). T-Cs ranged from 2 days (LS 180 model) to 18 days (PC-3 model). Irinophore C (40 mg/kg) engendered T-Cs ranging from 14 days (LS 180 model) to 87 days (Capan-1 model). Conclusion: Irinophore C improved CPT-11/SN-38 pharmacokinetics, promoted tumor drug accumulation, and increased therapeutic efficacy in a panel of five distinct human tumor xenografts.